When Facebook bought Oculus VR, you could see the cogs in Mark Zuckerberg's head whirring. Virtual reality is going to be social, and now, three years after the acquisition, Facebook is launching its first dedicated VR app. It's called Facebook 360. Right now the app is just a hub for 360 photo and video content posted to Facebook, and currently just for the Samsung Gear VR, but it's the first time Facebook has properly crossed the streams, so to speak. The app puts 360-degree photos and videos in front of your face, with four different feeds to choose from. The 'Following' feed will show you 360 content from your personal news feed; 'Explore' surfaces it from popular creators across the social network; 'Saved' gives you a place to put all of your favourite pics and vids for convenient viewing; and 'Timeline' is a place for all the 360 content you've uploaded yourself. Maybe it's time to invest in a 360 camera of your own. You can also react to pictures and videos as well as share from within the app. 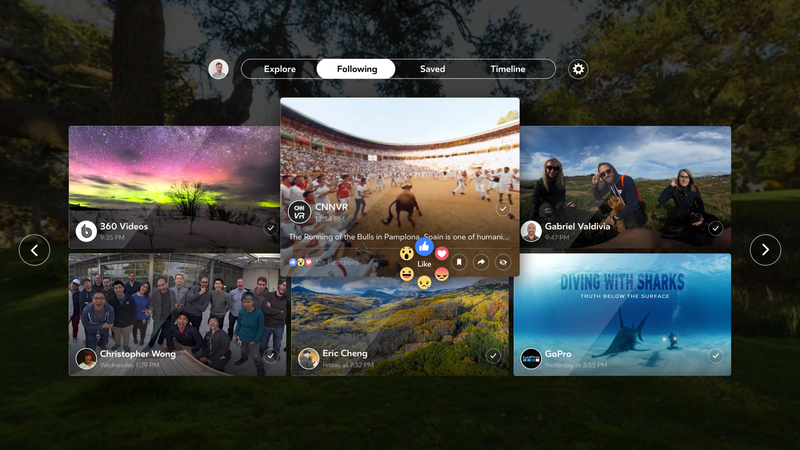 To download Facebook 360, just open the Oculus Store on your Gear VR and search for it. Alternatively you can download it from the Oculus site. Perhaps one day in the not-too-distant future, we'll be visiting each other's Facebook profiles in VR - or at least we expect that's where Zuck wants to take all this. 2017 has also seen the launch of Oculus Rooms, another social virtual reality app that's also only available on GearVR - but will come to the Oculus Rift later this year.